In case you haven’t noticed by the header or by pictures I’ve posted, Abby and I don’t look a thing alike. She doesn’t favor Hubs either so when we are seen out as a family, its pretty obvious that we adopted. We get the typical intrusive adoption questions like: “Where did you get her?” “How much did you pay for her?” and my favorite, “Did you see that movie on Lifetime where the birthmom murdered the adoptive parents and stole her baby back?” I’ve also had people ask why we didn’t choose to adopt a child that looked more like us so it wouldn’t be so obvious that she was adopted (as if it was something to be ashamed of but that is for another post). Long before we crossed the infertility hurdle – even before we were married – we knew that we wanted to adopt. So when we were told IVF was our only option and even then it would be unlikely that I could carry full-term, we started our adoption journey. Early on, we just felt called to be a diverse family. We weren’t sure whether that meant international adoption or domestic so we pursued all our options. We looked into Korea and Ethiopia but our health conditions kept us from applying and we were too young for many of the other countries (minimum age is 30). So when we chose the domestic adoption route, we still felt that pull so we were open to a child of any race. We let our family know of our desires upfront and were prepared to be faced with questions. The book Cross Cultural Adoption: How to Answer Questions from Family, Friends, & Community was extremely helpful in helping us form answers to some of the questions we would be asked before hand (I kept me from poking someone in the eye a time or two). We also took a class through Adoption Learning Partners and attended several workshops through our agency that were also extremely helpful. We knew that it was important to be prepared not only for questions from others but questions from Abby as well as she got older so we not only consulted our agency and workshops, but others within our community. We didn’t want our child to lose his or her ethnicity by growing up with white parents so education was very important for us. We knew going into our adoption that we would face a lifetime of questions. Some polite and others not so much. We knew that living in the south would probably raise the number of questions and eye-brow raises. But we also knew that this is where God was leading us and we knew that He would equip us and He has. We have a wonderful church and daycare where Abby is one of several biracial children in her class so she never has to feel like she doesn’t fit because of the color of her skin. Through the magic of the interwebs and social media, I have a group of other adoptive moms of diverse families where I can find information on caring for ethnic hair and finding a sunscreen that won’t turn Abby into the purple monster. I am so incredibly thankful for the community that I have found through facebook, twitter, and other forums that help me become a better mom for Abby. So can being a diverse family be trying at times? Absolutely. Would I trade it for the world? Not a chance! B. Your daughter is absolutly beautiful! My worst experience being out alone with Abby was having a grocery clerk ask me if it would be WIC. Seriously she wouldn’t have asked if I had a white child in my cart. I almost lost it. People can be so ignorant (AND RUDE). Sorry you have to deal with it too! Oh. No. She did not say that to you! Unbelievable! unbelievable people should not open their mouths sometimes!!! OMGosh! She is adorable! I just want to pinch those cheeks! Congratulations for following your hearts. Beautiful family & sounds like you are really doing a great job! You know, I’ve got to say that I knew that of course you would have to prepare yourself for your childs questions, but to have to deal with morons questions is really insane. I am glad that you can see the humor in that video…You are a much bigger woman than I am, I’d go with the eye poking thing! Believe me it has been difficult! But thank you for your encouraging comment! My sons are black. The twins are whole black (is that even the right term?!) and my youngest is bi-racial. My husband and I are very white. So we get a lot of looks when we’re out and about. I love it! I love keeping people guessing. We’re lucky to have our kids. I completely agree! I wouldn’t trade my daughter for the world! Someday I want my own diverse family too! I’m so glad you guys have Abby and so sorry people ore so dumb. I think you should get this shirt. I love that shirt! Must have! People can be so incredibly insensitive! You have a beautiful family and it’s wonderful that you are proud of it. My youngest two siblings are adopted and people have some interesting questions when they find that out. I remember once someone asked me if I felt differently about them than I did my biological sister. My answer was, “Nope, they still drive me crazy.” I would think adoption would be more talked about in this day and age, but it seems that people still have some crazy questions! I have 2 Biological siblings, and 3 adopted Siblings. My sisters and I are naturally blond, every single one of my other siblings have dark Hair. Everyone says, “Where’d the brown hair and eyes come from?” and my Mom always says, “Oh, some distant relative.” and she never tells them anything else. Next time someone asks just say, “Oh, a distant relative.” haha. Your daughter is adorable! When D and I were dating (when I was dating anyone) one of the questions I would ask was whether they were open to adopting. Don’t know for sure what is in our future but no guy could be “the one” unless his answer was “yes” to that question. Abby is gorgeous! My son is a Mayan Indian and I am white. If I had a nickel for every time someone asked me “Is he yours?” I’d be a very rich woman. The rudeness of people everywhere, we live in Belize, is just astounding! Found your blog through a comment you left on A Punk, A Pumpkin & A Peanut. 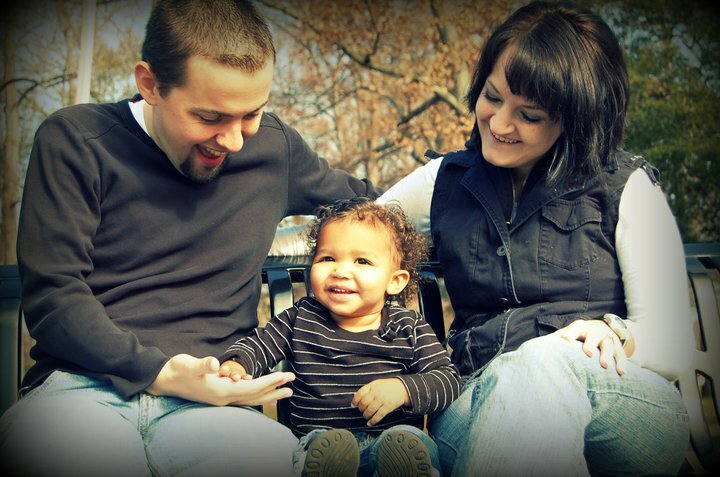 I think it’s so ridiculous that people even question biracial adoption. She is extremely lucky to have found a loving family…and you are extremely lucky to have found your daughter!